c1956 Watkins Westminster 10 watt Amplifier, courtesy of Michael Kerr. 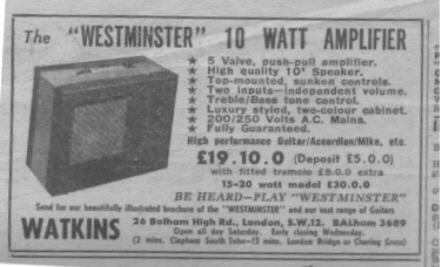 The Westminster was the first Watkins amp to be produced in any quantity in 1954, following earlier limited runs of experimental models. The earliest versions were apparently in plain grey coverings, probably like this Clubman. White and black with stars pattern, maroon & cream and then turquoise & cream versions followed. Early control panels were black, later ones silver. Through most of its manufacture period, the Westminster was a 10watt output amp, usually equipped with tremolo. There was a period from around 1959 to 1961/62 however when two versions existed : the usual 10watt single-channel 2-input version, and a 14 watt 2-channel 4-input version with a control panel and chassis very similar to the Dominator. (A version in a V-front cabinet apparently also existed briefly.) In this early period, it would seem that a non-tremolo 10watt version was also produced, but we have yet to find one. In 1963/64 when Watkins morphed into Wem, the Westminster Mk II acquired a new livery : black cabinet, silver control panel and a decorative aluminium plate covering the front of the amp. It was seemingly a smaller version of the Custom 15, itself a descendant of the Scout. Examples are rarely found today. In the late 60s it reverted to being the Clubman's big brother again, first as a larger version of the plain-looking solid-state model with tremolo, then circa 1972 both re-gained their valves and acquired identical black cabs with red/gold diamond pattern on black grillcloth and 12" speaker, very attractive and value-for-money little practice amps. The tremolo was omitted, either to reduce cost or because it was considered old-fashioned by that time It remained in production with some cosmetic changes until the late 70s. There was a bass version with a heavy-duty speaker. This is the earliest Westminster that we have come across so far. White and black covering, with star pattern. All very 1950's ish! I have never seen one like this one before! Is it a prototype? Is it a c1956 amp like the one below that has been "modified"? I'm not sure. It is very interesting though! It is fitted with the tremolo circuit. This red and cream amp ("Red-Star") has speed and depth controls fitted for the tremolo circuit, but still retains the single channel of the earlier 10watt amps. This very rare amp could well be the immediate fore-runner to the famous V-Front Dominator, or even its prototype. It uses the same control panel as the two single speaker 10watt combos above, but it has a power stage using two EL84 valves. It also employs 2 x ECC83 + 2 x EF86 valves in the preamp section, an unusual combination for a Watkins amplifier. And then of course there are the twin 10" Elac speakers!. A maroon & cream amp, rarer and seemingly earlier than the turquoise & cream models which followed. This single-channel 10 watt model would probably have 2 x ECL82 power valves, 1 x ECC83 pre-amp valves and an EZ80 rectifier. Price circa 15 gns. Another example of the fairly rare maroon & cream Westminster. 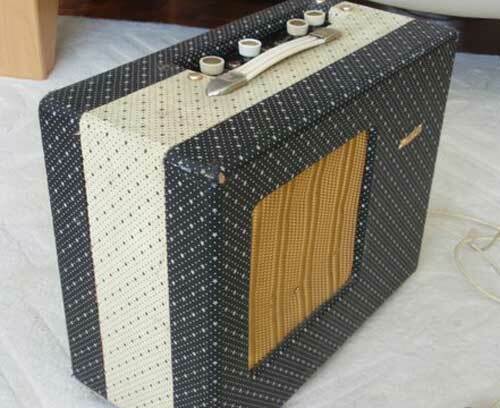 This amp is covered in black and cream "polka-dot" fabric. Can anyone please help us date this amp? A very unusual black and cream ("Black-Star") finished amp that also has a tremolo circuit, but has two channels. It is powered with EL90 valves, rather than EL84's. According to Charlie Watkins, only about ten amps in this format were made, to the acclaim of Jazz players who liked the sound. After the reverting to EL84's however, the Westminster "then sold like hot cakes"! The twin-channel 14 watt version of the Westminster which seemingly partnered the single-channel 10 watt model from c1959 until c1962/3, when it became the Scout. This model is in the most common turquoise & cream covering which was introduced in around 1960. Two EL84s provide the extra 4 watts, along with three ECC83 and an EZ81 rectifier. The chassis is apparently identical to early versions of the V-front Dominator. Price 19gns in the early 60s. Charlie Watkins is reported as saying that this version of the twin-channel 14W Westminster was made only briefly for 6 months or so, and it is certainly very rare nowadays. This may have been in the period before it became the Scout (?). Yet another change to the style of the control panel. As the ones above, but recently re-finished using the covering material used by Charlie Watkins on his current amps. As the maroon & cream model above, but in the later and more common turquoise & cream covering. 2 x ECL82 power valves, 1 x ECC83 pre-amp valves and an EZ80 rectifier. Price 19 gns. As above, but small control knobs. Yet another change in control panel design. One of the last of the Mk I Westminsters made. A mint condition amp that still has its original instructions, manufacturer's Guarantee Certificate, and a copy of the original Hire Purchase Agreement! Around 1964, when the transformation into Wem styling became complete, the Westminster acquired a new identity as a smaller version of the Custom 15 in a plain black cabinet with decorative aluminium facing and grill covering the entire front. It is assumed that the circuitry remained similar or identical to earlier models. This model is very rare and may have only been produced for a couple of years. Price was 23 gns in the mid-60s. Towards the end of the 60s the Westminster relinquished it's identity as a smaller version of the Custom 15 in favour of being the Clubman's big brother again, a solid-state model in an undistinguished black cabinet. It stayed this way until c1972. Price £30 10s 0d in the early 70s. Around 1972 the Westminster got it's valves back and a smart new livery, which it retained until the late 70s. The tremolo feature was dropped at this point, either because it was considered old-fashioned by that time or as a cost-saving measure, possibly both. The cabinet, speaker and control panel are identical to that of the contemporary Clubman model. Valves: 2 x ECL82; 1 x ECC83. Price £51.00 in the mid-70s. The Westminster Bass was simply a 1970s Westminster combo with a heavy-duty 12" speaker. A cosmetic make-over which must have been considered an improvement at the time. Now fitted with a "treble boost" button. Price: £85.00 in 1978. What seems to be an actual example of the above catalogue image, but with the carrying handle on the opposite side of the case. And another one as above. The photos also feature a rather nice old Watkins Rapier 33 Solid. Both are owned by Grame Fletcher in the UK. We are not quite sure where this one fits in with the above models, except that it was produced sometime towards the end of the 1970's. Can anyone help us out with more details? John Beer of Amp-Fix in Devon, England is now producing a superb re-issue of the early-60's Westminster which has been approved by Charlie Watkins. Advertisement from the "Melody Maker", 14 June 1958. Many thanks to Jim Elyea !